Say not in grief ‘he is no more’, but in thankfulness that he was. 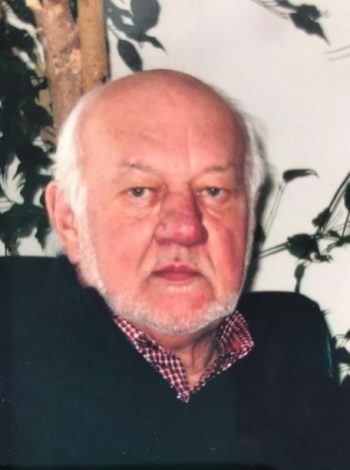 Passed away peacefully on April 13, 2019 at the Health Sciences Centre, St. John’s, at 85 years of age, with his loving wife and children by his side. Cam, also known as “Grumps” to family and friends, is predeceased by his father, Johnathan and mother Elizabeth (nee Russell). Leaving to mourn his loving wife of 53 years, Sylvia (nee Legge), son Christopher (Heidi), and daughter Andrea (Paul). Also leaving three grandchildren who were a source of deep pride and love: Sarah, Johnathan and Olivia Carew. “We will miss you, Grumps”. Cremation has taken place at Carnell’s Funeral Home, with a book of condolence available on the website. A celebration of a life well-lived will take place at a later date. The family have been comforted by the many expressions of condolence, and the memories shared of the character and spirit that was Cam. In lieu of flowers, donations to the St. Bonaventure’s Bursary Program (www.stbons.ca/bursary-program/) or the St. John’s SPCA will be gratefully received. Deepest sympathy to you Sylvia, and your family. Our kindest regards bill and diane barker. Very sorry to hear about Cam’s passing. Our thoughts and prayers are with you & your family at this most difficult time. So sorry to have read about Cam’s passing. Thinking of you all at this difficult time..
Was very surprised to learn of Cams passing. It was only a few weeks ago we talked when he was looking for information on John. He had a great spirit and warmth which was demonstrated by his delivery of Sylvia ‘s lunch after his retirement ! So sorry to hear of the passing of Cam. I am so grateful for the time I had spent with him and with you folks in my early days. Thanks to Cam and you Sylvia! I probably would not be where I am today. Cam gave me my first job and from there I was able to better myself and carve out an outstanding life here in Alberta. Thank You and Cam for everything you have done for me. I will always remember driving around the city listening to the radio and his favourite song ” I’m just a Gigilo ” would come on and he would just belt it out. Haha So many great memories. Love to you and the family! Dear Sylvia and Family, sorry to learn of the passing of Cam, please accept our deepest Condolences. I remember quite fondly when we worked together at The Evening Telegram, Cam took a lot of pride in his delivery work and could be counted on to get the job done in all types of weather. Sylvia and family – extending deepest sympathy on the loss of your loved one. May memories comfort you at this difficult time..
Sylvia Chris and Andrea, we are so sorry to hear of Cam’s recent passing. You are all in our thoughts and prayers. My deepest condolences to the family. I have so many fond memories of get together on Freshwater Road . May he rest in pease. So very sorry to read of your dad’s passing. It was always a pleasure to be in his company as his great humor & wit was so much fun. May the wonderful memories you all shared help you through this most difficult time. Sylvia, Christopher and Adrea, We extend our deepest sympathy to you and all the members of your family. You are in our thoughts at this sad time. Our sincere condolences to you all. Condolences to the entire Carew family. May fond memories bring you comfort during this difficult time in your life. Look back on all the good memories you were able to have and smile that you were able to share these before he passed away. Please accept our condolences. So sorry for your loss.. Condolences from Ray and Millie Brake and family .Thinking of all the family . Sylvia and family. We are so sorry to hear of Cam’s passing. Kevin ,Joyce and I are in Alberta visiting family and we just heard of his illness and passing..May the many good memories that Cam enjoyed with his family and friends during his lifetime comfort you during this difficult time. So very sorry for your loss. You are all in our thoughts. Hope to see you soon. Thinking about you at this difficult time. Please know that our thoughts and prayers are with you. May all the precious memories bring you comfort. Our deepest condolences to all the family. Chris, I want to offer my sincere condolences to you, your Mom and family on the loss of your Dad. So sorry to hear of MR. Carew(cams) passing. He was always a joy to be around, always smiling and was not afraid to make us laugh. My thoughts and prayers are with all of you during this sad time. Cam was my Newfoundland dad, and even if he was not much older than I am that is how I looked at him. I was very sad to read the obituary this morning. Rosemay and I share your pain and our thoughts are with you in this very sad moment. Sorry to hear of Cam’s passing. You are in our thoughts & prayers. I’m so sorry to hear of Cam’s passing. He was a wonderful neighbour for many, many years. I’m out of the country right now but know my thoughts and best wishes are there on Aspen Place with you all. Chris, so sorry to learn you have lost your Dad. Sincere condolences to you and your family. Sylvia, Chris and Andrea please accept my most sincere condolences. I will never forget all the kindness and hospitality Cam and Sylvia always showed me. So many great memories. A fine life lived. R.I.P. Cam. Our thought and prayers are with you as you come to terms with your loss. We have many fond memories of Cam and his sense of humor. He had such a kind spirit with children amidst his teasing. RIP Cam. Please accept our sincere condolences. We are thinking of you and pray that the many memories you have made over all the years will comfort you during this difficult time.